NFL Playoffs are here, and 10 of the GCAS writers make their picks and answer a few simple questions about the upcoming playoffs. Albert Nguyen: Denver will win because the NFL is fixed and there is no way Eli will have more rings than Peyton. The defense is very opportunistic and playing well. The weapons that Peyton has at his disposal are talented -- but more importantly, they are disciplined and have bought into the system. Jonathan Lau: New England will win because I am a homer. It would be nice to beat the Packers to exact some revenge for Super Bowl XXXI. Phil Vuong: Seattle, because they are cheaters. Norman Leung: Green Bay will pull it out. Jonathan Mok: I got the Texans winning the Super Bowl because the entire city of Houston is relying on this team ala the Rockets in 1994. Everybody is repping that red, white, and that blue, and championship windows don't stay open forever. I have never been a huge fan of Kubiak, but I am hoping that our skid into the playoffs will cause him to rethink his playcalling and open up the playbook a tiny bit so that everyone in the stadium won't know exactly when he'll draw up his patented draw play. The league knows all about JJ Watt now, but keep an ear out for Whitney Mercilus in the playoffs. As far as the offense is concerned, I hope Matt Schaub and Owen Daniels got together over new year's to run some routes because that connection will be key going forward. Peter Wang: The only way to complete the storyline is for Peyton to win it all this year. 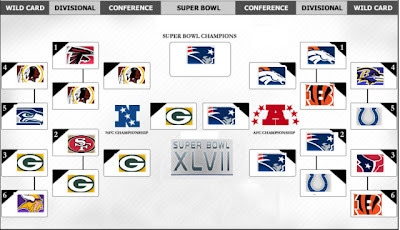 Also, it's only fitting that we get another Manning v Brady in the AFC championship game. Jen Tsou: Is this like the one office chick who picks based on team colors or better weather... 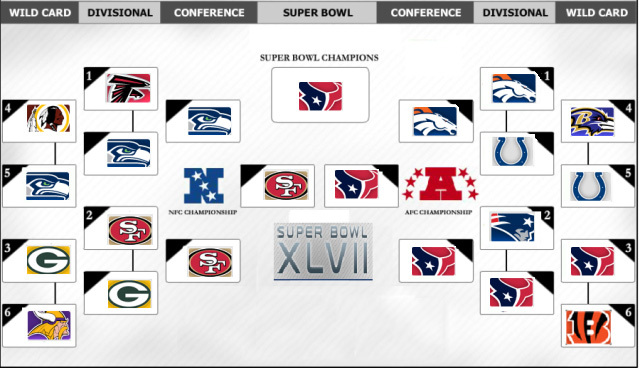 I predict San Francisco vs New England in Super Bowl. I can't walk through the reasons. Call it woman's intuition. Andrew Chow: Denver will win the super bowl to complete the whole Peyton returns arch/story line. Andrew Leu: The two hottest teams ending the season (Denver and Seattle) but I gotta go with the resurgence of Peyton. Guy knows how to lead the troops and looks healthy. Caleb Li: Since I completely made my bracket as a bias fan, I am going to remove the Packers as a possible choice for this question. I think the team with the most upside has to be Seattle, but I think they will find it hard to win four tough games in a row. I believe winning home field advantage was huge for the Broncos, it forces New England to have to play in the high altitude in Denver. Because of that I have them making it to the Superbowl, and really can you have Peyton lose in his hometown of New Orleans?! I doubt it. So I would have to pick the Broncos if i couldn't do my fan boy pick of the Packers. Who was the biggest surprise team to make the playoffs? Albert Nguyen: Biggest surprise team = Indianapolis Colts. They were 2-14 last year. With the addition of Andrew Luck, the Colts had a 9-game turnaround. That is absurd. Jonathan Lau: Vikings - Christian Ponder?! 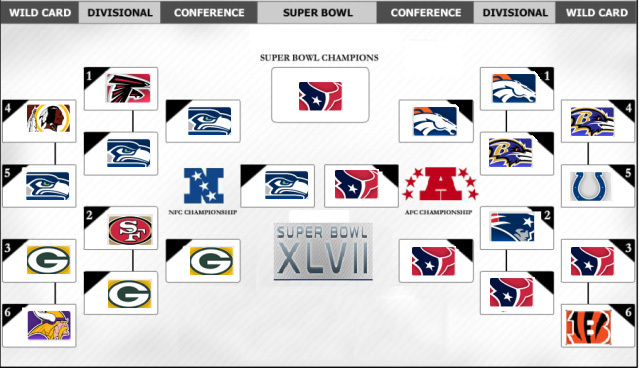 Also, they probably should've been eliminated by the Texans in Week 16. Jonathan Mok: Biggest surprise team has to be the Seattle Seahawks. I was a big fan of Russell Wilson in college, but for him to enter the NFL, win a starting job in training camp, and propel this team back to the playoffs has been a joy to behold. I'm not taking anything away from the Seattle defense, but this kid has displayed a maturity well beyond his years. Peter Wang: Biggest surprise team = Minnesota Vikings. All Day has been carrying the whole team's offense, and for him to do it after knee surgery has been nothing short of amazing. 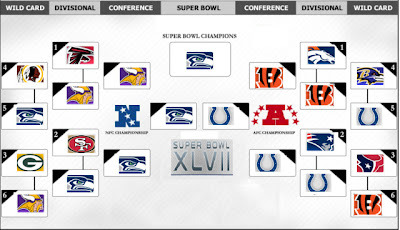 Andrew Chow: Biggest surprise team = Indianapolis Colts. Because they sucked last year. Andrew Leu: Biggest surprise - Minnesota. Didn't hear much hoopla before the season. Even the first quarter of the season, the talk was about the packers and bears. The vikes played the most consistnent w Ponder at the helm. He has been solid and AP did his thing. Caleb Li: Biggest surprise team has to be the Colts, everyone thought this year was going to be a tough one for Andrew Luck. Even the great Peyton Manning didn't come close to making the post season his first year in the league. The Colts looked awful last year, clearly the surprise of the year. Which player is going to break out this postseason? Albert Nguyen: Break out player = Any Green Bay wide receiver. Jonathan Lau: Stevan Ridley - assuming my bracket holds, Ridley could have some nice matchups against Indianapolis (29th ranked rushing defense) and Green Bay (17th ranked rushing defense). I think the Pats are going to need some balance on offense instead of being fully dependent on Brady like the last two Super Bowl failures. Jonathan Mok: Put your horns up for this year's break-out player: Earl Thomas. RG3 may be the storyline, but ET may be the ending of this weekend's Redskins/Seahawks matchup. Look for Earl to be flying all over the field in both run support up at the line and pass defense in the secondary. And if/when Seattle makes it to the next round to face Atlanta, you know Matt Ryan will leave a couple passes up for grabs. Hook 'em. Peter Wang: Break out player = If there are still people out there who don't believe in Russell Wilson, then his postseason run should remove all doubts of him being a tier 1 quarterback. Andrew Leu: Breakout postseason player - Russell Wilson. He'll be cool calm and collective throughout the playoffs (I really hope Seattle gets past the wildcard...). But I'm a fan of wilson. The offense suits him well and he's been making great decisions. Seattle is in good hands for the next decade. Caleb Li: I am going to have to go with Casey Hayward, the defensive back on the Green Bay Packers. Not many people know who he is, but he is the reason this team was even able to turn the season around after losing Charles Woodson to injury. Like Sam Shields in 2010, I see Casey being the key to giving the Packer defense the flexibility to move Woodson around and bring him on different blitz packages. Which team(s) should have made the playoff? Albert Nguyen: Teams who should have made the playoffs = Bears, Giants, Cowboys. Chicago won 10 games, but finished 3rd in their division. New York went 1-3 against the AFC North and 3-5 on the road overall. That is not going to cut it. Dallas, enough said. Jonathan Lau: Bears - should've held off Seahawks at home in Week 13, which probably would've sealed up the playoff spot. Steven Wang: Teams who should have made the playoffs = Bears just got unlucky and ran into Minnesota and GB, twice unfortunately. Lions no joke either. Tough draw for Lovie this year. Phil Vuong: Cowboys, but they got Romo'ed. Jonathan Mok: With the NFC East in disarray, this was the year that the Cowboys could have snatched the opportunity to make a postseason run. But yet again, when it was all said and done, the Boys left their millions of fans with millions of what-ifs. Peter Wang: Teams who should have made the playoffs = Pittsburgh Steelers. Losing Ben in week 12 and 13 proved too much for the team to overcome, not to mention their running back dilemma and defense injuries to stars Polamalu and Ike. Andrew Chow: Teams who should have made the playoffs = Dallas Cowboys. Injuries can't be a real excuse since all teams lose starters, but injuries ruined the Cowboys chances. Jerry Jones has promised changes....Cowboys will make the playoffs next season for sure. Andrew Leu: Teams that should have been in the playoffs - giants and bears. Both fizzled at the end after a solid first half. Caleb Li: Giants, short and simple they are a championship quality team that is too lazy to care in the regular season. This time they woke up too late, or maybe it was just the fact that the Redskins were able to just win more. 9-7 should never be good enough for the playoffs and the 2011 Giants just got lucky. Before someone notices, I did change my pick in the Colts verse Ravens game. Purely on Ray Lewis retiring, yeah might seem like a week argument,but I believe. How am I the only one that has the #1 seed in the NFL, the 13-3 Atlanta Falcons advancing one game? I know they are overrated but come on. 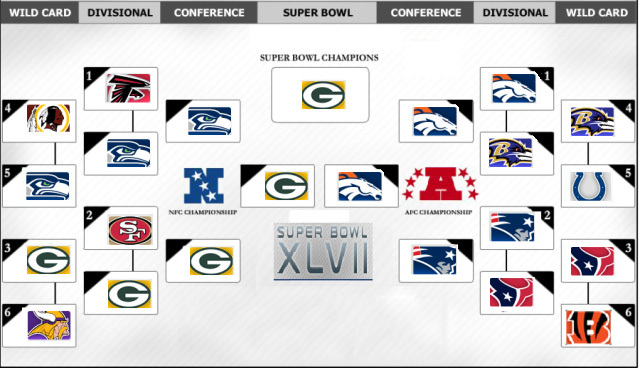 The whole "get hot and play games on the road and we'll win the superbowl" mantra is so overstated. I understand that. But the last 7 years doesn't erase the last 70. PS: I love how 7 out of 10 predicted a Brady/Manning showdown. I really hope it comes true. NICE! That must have took a lot of time. 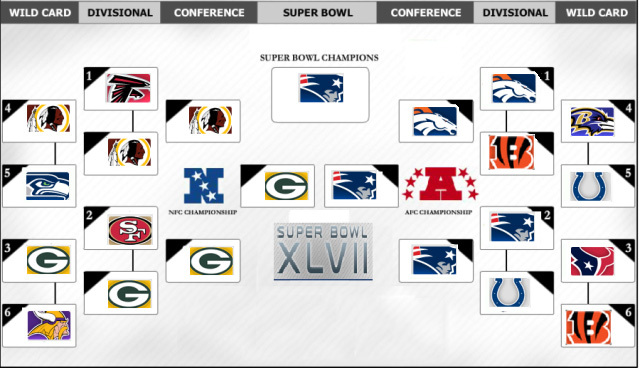 My bracket looks awful, there's no way the Colts get that far. I love it. Giant didn't win down the stretch, can't crush GB and SF and then get crushed by Wsh, Cin, and Balt. I think everyone is glad they aren't in it the playoffs since they are capable of beating anyone. How were the 2011 Giants lucky? Were they lucky Romo played like Romo in week 17 to determine who went to the playoffs? Lucky that Atlanta couldn't convert on 4th and 1 twice? Lucky that Rodgers couldn't make any passes? Were they lucky to recover two muffed punts against SF? Lucky that Welker dropped a difficult pass to ice the game or lucky that Manning made that pass to Manningham? Just seems like those teams didn't execute when it mattered. Games are won and lost by a few plays, but let's not discount the Giants on playing extremely well in all those matchups and even outplaying teams that had better records. Giants definitely deserved their last two rings. Albert, sorry about that. I think Romo is really good actually, just don't get why he can't win when it matters, is it mental? Caleb, got it, I just thought you meant they were lucky to win. Winning NFC East with a 9-7 is either a reflection on how bad or even the conference is. Don't think anyone would say the conference is bad, just inconsistent. 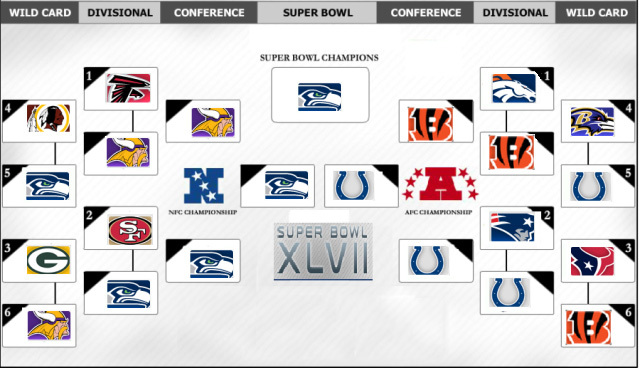 I honestly think the NFC teams are good and beat up on each other. You don't have one dominating team that can go 14-2, 13-3, or 12-4 because everyone loads up in the off-season to combat each other. For example, Dallas went all fast/quick DBs to play against NYG. But at the same time, their fat/slow DL got owned by Washington. Talent wise, NFC East is the best in the NFL from top to bottom IMHO. I agree, the NFC East is definitely the hardest division to play in. Well done, Mok, Leu, and Caleb! We should delegate points for each round?